Background: Cellular damage initiated by reactive oxygen species (ROS) is the main cause of numerous severe diseases and therefore for this reason, the natural antioxidants have note worthy significance in human health. Capsaicin possesses noteworthy analgesic and anti-inflammatory properties. It also possesses healing effects for treatment of arthritis, diabetic neuropathy, gastric lesions, and cardiac excitability that is why it is incorporated in creams and gels. Objective: The present study was carried out to estimate the in vitro antioxidant and ROS scavenging activities of capsaicin against muscle precursor cells. Till date,no investigation has been carried out to study the effect of capsaicin on myoblasts.Materials and methods: Herein, the cytotoxicity was induced by endotoxin lipopolysaccharide (LPS) to analyze the effect of capsaicin on LPS induced inflammation and apoptosis on muscle cells. To find out the toxicity of endotoxin, myoblasts were exposed to different concentrations of LPS, viability and morphology was checkedby the means of CCK-8 test and microscopy, respectively. Apoptotic cell death was examined by fluorescence staining. Additionally, LPS-induced apoptosis was determined by mRNAexpression of calpain, caspase-3 and tumor necrosisfactor alpha (TNF-α), and were quantified by qRT-PCR. Results: The outcome of the presentstudy demonstrated that LPS stimulation generatestoxicity in dose-dependent manner. Pre-treatmentof myoblasts with capsaicin can considerably alleviate LPS-induced inflammation. Conclusion: In conclusion, this study indicates that dietetic supplementation of capsicum may help to alleviate/reduce the inflammatory effects and is therefore potent source of natural antioxidant agent which can be utilized to control muscle related diseases, such as myotube atrophy. In the present study cytotoxicity was induced by LPS to analyze the effect of capsaicin on LPS induced inflammation and apoptosis on muscle cells. The results of this investigation demonstrated that LPS stimulation generates toxicity in dose dependent manner. Pre-treatment of myoblasts with capsaicin can considerably reduce LPS induced inflammation. It has been concluded on the basis of results that the dietetic supplementation of capsicum may help to minimize inflammatory effects and are potent sources of natural antioxidants which can be utilized to control muscle related diseases such as atrophy. Capsaicin commonly abbreviated as CAP, [Figure 1] is also acknowledged as axsain, mioton, and zostrix. CAP is the spicy element of hot chili peppers of capsicum.It is mainly known for its essence, which makes it a regular constituent in human diet.The health benefits of CAP are remarkable. At present, CAP is used in topical creams and gels to alleviate neurogenic pain as it possesses noteworthy analgesic and anti-inflammatory properties. It also possesses some curative effects for the treatment of arthritis, diabetic neuropathy, gastric lesions, and cardiac excitability. CAP has demonstratedfine antibacterial activity, verified to inhibit platelet aggregation and growth of different cancer cells. Moreover, CAP has shown efficient inhibition of tumor expansion and has found to induce apoptosis under in vivo environment without any toxic effects. Additionally, CAP inhibits adipocyte differentiation process through AMP (Adenosine monophosphate)-activated protein kinase. CAP also shows significant chemopreventive and therapeutic properties against certain mutagens and carcinogens. Thus, on the basis of above-mentioned findings, it was proposed as a novel therapeutic agent for treatment of leukemia. Furthermore, the topical application of CAP has clearly revealed inhibition of phorbol myristate acetate-induced mouse skin tumours, blockage of cultured human leukemia HL-60 cells and attenuation of NF-κB and tumors promoter 12-0-tetradecanoyl phorbol-13-acetate induced carcinogenesis. CAP has also been found to suppress bone resorption and it also attenuates inflammatory bone loss induced by lipopolysaccharide. In addition,topical application of CAP can initially induce ear edema in mice and neurogenic inflammation in human skin, re-application of the compound suppressed subsequent inflammatory response. CAP is also apotent inhibitor of platelet aggregation mediated bythe arachidonic acid cascade. Alternatively, macrophageswere found to inhibit calcium-ionophore stimulated pro-inflammatory responses, such as generation of superoxide anion, phospholipase-A activity and membrane lipid peroxidation when treated with CAP. It has been proved that tumor promotion related to inflammatory processes can stimulate the proliferation of initiated cells. In this direction capsaicin could act as an agent to promote anti-tumor effect. CAP bestow potent hepatoprotective effect against carbontetrachloride-induced liver toxicity, which might be explained partially by reducing the generation of free radicals, induction of antioxidant defense systems, and inhibition of active caspase-3 expression. Therefore, CAP is a possibility to be a choice for hepatoprotective therapies asnatural products. CAP has protective effecton apoptosis in rat hippocampal neurons induced byhypoxiare-oxygenation. Researchers have revealed that the administration of CAP and isoflavone promotes hair growth by increasing insulin-like growth factor-I production in mice and in humans with alopecia., CAP protects against kainic acid (KA)-induced epileptogenesis in mice and showed anti-ictogenic, hypothermic, anti-oxidative, anti-inflammatory, and anti-apoptotic effects when it was treated for 3 days after a kainic acid treatment. CAP treatment significantly decreased levels of oxidant activity and increased the antioxidant activity in the blood and brain of KA-treated mice. In addition, CAP significantly lowered the KA-induced increase in the concentration of the cytokines TNF-α in the brain. CAP promotes the healing of gastric ulcer, possibly by its gastric hyperaemia. Nonetheless, it is suggested that CAP, is and should be widely promoted forthe treatment of neuropathic pain, but should be used with caution in patients who are at risk and have impaired wound healing system.,CAP has been shown to damage the sensory nerve endings; repeated topical application of CAP also results in degeneration of the cutaneous autonomic nerve fibers, decreasing the pain sensation. It is anticipatedthat the stimulation of epidermal growth factor in salivary glands and serum may be one of the mechanisms by which CAP-sensitive nerves promoteto the gastroprotective and ulcer healing of stomach. In the present study, we studied the effect of calpain inhibitor PD150606 on LPS-induced damage of myoblasts for the first time. Myoblast cells were cultured in a humidified incubator at 37°C with 5% CO2 and 95% air in Dulbecco's modified Eagle's (DMEM, pH 7.4) medium supplemented with antibiotics solution (1%) and FBS (Fetal Bovine Serum) (10%) as mentioned somewhere else. A standard CCK-8 evaluation method was employed to examine cell viability. A cell density of 1×104 cells/well was maintained in 96-well tissue culture plates which were incubated overnight for proper attachment and growth. Thereafter, the cells were treated with different concentrations (5, 10, 25, 50, 100, 200, and 300 μM) of CAP and incubated more for 24 h. After specific exposure of CAP, the incubated cells were treated with 10 μL of water-soluble tetrazolium-8 (CCK-8) solution for 4 h at 37°C following the manufacturer's instructions and absorbance was measured at 450 nm by a microplate spectrophotometer (model 680; Bio-Rad Laboratories, Hercules, CA, USA). In order to assess the anti-apoptotic and anti-inflammatory effect of CAP, myoblast cells were pre-exposed to CAP (50 and 100 µM) overnight and then treated with LPS (100 μg/mL). The viability of the treated samples was expressed as a percentage of untreated control samples. The changes in the morphology were checked using a light phase-contrast microscope (Olympus CK × 41). The percentage of antioxidant activity (aa %) of each substance was assessed by DPPH free radical assay. The measurement of the DPPH radical scavenging activity was performed as described by Brand-Williams et al. The samples were reacted with stable DPPH radical in a methanol solution. The reaction mixture consisted of sample (0.5 mL), absolute methanol (3 mL) and 0.3 mL of DPPH radical solution (0.5 mM in methanol). When DPPH reacts with an antioxidant compound, which is capable of donating hydrogen, it is reduced. The changes in color (from deep violet to light yellow) were observed [absorbance (abs)] at 517 nm after 30 min of reaction using a microplate spectrophotometer (model 680; Bio-Rad Laboratories, Hercules, CA, USA). Methano 3. 8mL served as blank. The control solution was prepared by mixing methanol (3.5 ml) and DPPH radical solution (0.3 ml). The scavenging percentage was calculated using the formulae. ROS generation after the exposure of LPS to cells was observed by confocal microscopy in this study. The C2C12 cells were seeded in coated dishes and allowed 8 h to attach and grow. After proper attachment, the cells were treated with LPS and CAP for specific time (24h) duration.The 2', 7'-dichlorofluorescein diacetate (DCF-DA) staining was used to measure ROS formation. The DCF-DA solution was prepared in DMSO. The myoblasts were stained with DCF-DA for 30 min at room temperature and then completely washed with PBS (Phosphate buffered saline) to remove surface excess DCF-DA. Cells which generated ROS, have up taken DCF-DA and emit green fluorescence under 524 nm. Stained cells were viewed under a fluorescence microscope. In addition, the myoblast death was confirmed by confocal microscopy. The C2C12 cells (1×104) were seeded in confocal dishes (SPL Lifesciences Co. Ltd., Korea) and allowed to grow overnight. The myoblasts were treated with LPS and pre-exposed with CAP as described in present study. AO/EB (Acridine orange/Ethidium bromide) staining was used to examine apoptotic body formation. The staining solution was added and the cells were further incubated in staining solution for 30 min. Next, the cells were rinsed off from staining solution and washed with PBS twice. Stained cells were viewed under a fluorescence microscope. The images were acquired on a CLSM as reported earlier. Total RNA from myoblasts (both control and treated) were extracted using a Hybrid-RTM kit (Geneall biotechnology Co., Ltd. Korea) strictly followingmanufacturer, instructions. Briefly, cells were lysed using Ribo ExTM solution. After that, chloroform (HPLC, 99.0%) was added to cell lysate. The chloroform helps in the separation of the homogenates into aqueous and organic phases. The RNA is separated in the aqueous phase although DNA and protein remained in the interphase and organic phase, respectively. Further, the aqueous phase containing RNA was mixed with buffer RB1, RNA binding buffer, provided with the kit following the manufacturer's, instructions and then binds to a spin column. After washing with SW1 and RNW (RNase free water) buffers, RNA was eluted by RNase-free water. Total RNA was quantified by OD260/OD280 nm, absorbance ratio 1.8~2.1 and then was immediately used for cDNA synthesis. cDNA synthesis was carried out using MMLV reverse transcriptase 1st-Strand cDNA synthesis kit (WI 53713, Epicentre). The as-synthesized cDNA was used immediately for RT-PCR. For real time PCR, a 20-μL reaction mixture was made for each targeted gene using the following components: 10 μL of 2 × Sso Fast Eva Green Supermix (Bio-Rad), 20 pmol for the primer pair (10 pmol each of the forward and reverse primers), and 100 ng of cDNA were mixed together as described elsewhere. The method was explained in detail in our previous article. The relative quantification ratios were obtained following the equation as described by Pfaffl. The volume of RNA used for the synthesis of cDNA depends upon the concentration of RNA. To analyze the μ-calpain, caspase-3/7 and TNF-α mRNA expression levels in the LPS (100 μg/ml) stimulated cells and in LPS (100 μg/mL) stimulated cells preexposed to CAP (50 μM) respectively, qRT-PCR was performed using CFX96™ Real-Time PCR detection system (Bio-Rad). The primers used for the qRT-PCR assay were μ-calpain-F(5'-TCAACCTTCGGGAAGTCAGC-3', forward primer for the μ-calpain gene); μ-calpain-R (5'-CATGTCATCCCCTGCCAACT-3', reverse primer for the μ-calpain gene); Caspase-3-F(5'-ACTGGAAAGCCGAAACTC-3', forward primer for the caspase-3 gene); Caspase-3-R(5'-GCAAGCCATCTCCTCATC-3', reverse primer for the caspase-3 gene); Caspase-9-F(5'-TGAGGAGGACCACAGCAA-3', forward primer for the caspase-3 gene); Caspase-9-R (5'-GGGTCTCACGCCATCTTT-3', reverse primer for the caspase-3 gene); TNF-α-F(5'-CTCGAGTGACAAGCCCGTAG-3', forward primer for the TNF-α gene); TNF-α-R(5'-TTGACCTCAGCGCTGAGCAG-3', reverse primer for the TNF-α gene); GAPDH-F(5'-CCTTCCGTGTTCCTACCC-3', forward primer for the reference gene); and GAPDH-R(5'-CCTGCTTTCACCACCTTCCTT-3', reverse primer for the reference gene), respectively. The reaction was carried out in 20 μL using Sso FastTM Eva Green Supermix (Bio-Rad) according to the manufacturers' instructions. Relative ratios were calculated based on the 2-ΔΔCT method. PCR was monitored using the CFX96TM real-time PCR detection systems (Bio-Rad). The calpain activity was determined using a calpain activity assay kit (Abcam, ab65308) according to the manufacturer's instructions. Firstly C2C12 cells in each sample were digested by conventional method. The cell suspension was centrifuged for 1 min at 10,000 ×g and re-suspended in 100 µL extraction buffer followed by incubation on ice for 20 min. Again centrifuged for 1 min at 10,000 × g, the supernatant was used for the assay. Protein concentration in the supernatant was determined using the BCA protein kit with bovine serum albumin as standard. The cell lysate (50 µg) were diluted to 85 µL of extraction buffer. For positive control, 2 µL active calpain was added to 85 µL of extraction buffer. The untreated cell lysate was used as negative control. Tenmicrolitreof 10 × reaction buffer and 5 µL of calpain substrate were added to each assay. After incubation at 37°C for 1 h in the dark, samples was read in a fluorometer equipped with a 400 nm excitation and 505 nm emission filters. The experiments were carried out in replicates. Analysis of the activity of caspase-3 and caspase-9 in myoblasts was carried out using a caspase-3/CPP32 and caspase-9 colorimetric assay kit (BioVision). Cells in each group were digested and then centrifuged for 1 min at 10,000 × g. Chilled cell lysis buffer (50 μL) was added to the cell pellet, which was then incubated on ice for 10 min. After the protein concentration had been analyzed, an additional 100 μg of protein was mixed with 2 × reaction buffer and DEVD-p-nitroanilide (pNA) substrate (for caspase-3) or LEHD-p-nitroanilide (pNA) substrate (for caspase-9). The incubation was carried out at 37°C for 2 h. This assay was based on detecting the chromophore pNA after it had been cleaved from the labeled substrate DEVD-pNA or LEHD-pNA. pNA light emission was quantified using a microfiter plate at 405 nm. Statistical evaluation was carried out by one-way analysis of variance (ANOVA) followed by Duncan's multiple range test (DMRT). A value of P < 0.05 was considered statistically significant. All the values were expressed mean values ± SD. The proliferation of C2C12 cells in medium containing CAP was tested using the CCK-8 assay. The unexposed cells were kept as control. The proliferation was observed at different concentration of CAP after specific incubation time (24 h) as described in method section of the present study. As shown in [Figure 2]a, the unexposed control cells showed confluence at 48 h, whereas the stimulated CAP (200 µg/mL and 300 µg/mL) could significantly decrease the viability of C2C12 cells after specific incubation time. It was observed in the present study that with the increasing concentration and a maximum of 17.17% and 23.37% proliferation was found with 50 µM and 100 µM, respectively after 24 h incubation period. No significant proliferation was found with 5 µM, 10 µM and 25 µM concentrations, respectively. The data lead to the conclusion that the growth proliferation is concentration and time dependent [Figure 2]b. Figure 2: In vitro proliferationof myoblast cells (a) exposed to CAP and incubated for 24 h (b) Exposed to CAP (50 and 100 µM). (c) Exposed to LPS (100 µg/mL), pre-treated with CAP (50 and 100 µM) after 24 h of incubation. (d) Free radical scavenging activity (DPPH) of CAP at different concentrations (µM) CAP, Capsaicin. In order to check the anti-inflammation role of CAP, the cells were pre-exposed to CAP and then treated with LPS(100 μg/mL). The cells pretreated with CAP maintained their regular morphology. LPS-induced cell death was significantly decreased in a dose dependent manner when the cells were pretreated with CAP (50 µM and 100 µM) [Figure 2]d.
Morphological alterations induced by LPS pretreated with CAP in C2C12 cells were also tested. Untreated cells were thin and elongated with two tapering ends [Figure 3]a. Few granulated structures were noticed [Figure 3]b.The rescue effect of CAP was showed in [Figure 3]c.
Figure 3: Representative phase contrast images of muscle precursor cells (a) unexposed control cells, (b) exposed to LPS (100 µg/ml), (c) exposed to LPS (100 µg/mL), pre-treated with CAP (50 µM). (White arrow indicates the undamaged cells; white arrow head indicates damaged rounded structures). Representative confocal images of myoblasts (d) unexposed control (e) exposed to LPS (f) exposed to LPS (100 μg/mL) and pretreated with CAP (50 µM). Dead cells are labeled by EB and have red nuclei. Live cells are labeled by AO and have green nuclei. (Dotted arrow indicates the dead cells while arrow indicates the living cells). Microscopic images [Figure 3]g, h, i magnification: ×40; [Figure 3]j, k, l, magnification: ×100) show the intracellular ROS in myoblastcells. AO, ; CAP, Capsaicin; EB, ; LPS, lipopolysaccharide; ROS, reactive oxygen species. From the CLSM images [Figure 3], it is obvious that the proportion of living and dead cells corresponds to both time and the concentration of LPS. The significant increase in numbers of apoptotic cells was observed at 24 h of incubation with a high concentration (100 μg/mL) of the LPS [Figure 3]e. Number of apoptotic cells was significantly decreased when the cells were exposed to CAP [Figure 3]f.
Fully grown myoblasts were switched to the differentiation medium to produce myotubes. The myoblasts were differentiated into myotubes after 5 days, however differentiation occurred after 3 days of incubation period. Myotubes were used at this stage. The mRNA expression of calpain-1, TNF-αand caspase-3 were significantly (P < 0.05) increased in LPS induced C2C12 cells, whereas a significant decrease (P < 0.05) in mRNA expressions of aforementioned genes were observed when pretreated with CAP [Figure 4]. Figure 4: mRNA expression of myoblasts induced with LPS and pre-exposed to CAP (50 µM) after 24 h incubation. Calpain and caspase 3/9 activities of C2C12 cells, untreated cell lysates served as negative control, extraction buffer with activated calpain served as positive control. CAP, Capsaicin. In our investigation it was affirmed that the exposure of LPS for 24 h significantly (P < 0.05) increased calpain activity of myoblasts. The increase in calpain activity was observed in positive control (active calpain-treated) and was almost twice than that wasfound in the untreated C2C12 cells. LPS treatment increased calpain activity compared to untreated cells. However, on the other hand, calpain inhibitor CAP (50 μM) reduced calpain activity in LPS (100 μg/mL) induced C2C12 cells. Similarly, no calpain activation was observed in C2C12 cells supplemented with CAP alone [Figure 4]. Helen et al. studied LPS-induced protein degradation in isolated murine myotubes, and Huang et al. reported that a large portion of myotube protein degradation was mediated by calpains. Calpain activity was measured at myotube stage. In addition, CAP has been proposed to reduce adipose tissue and triglycerides, to stimulate carbohydrate oxidation, and to decrease appetite. Transient receptor potential vanilloid 1 receptor (TRPV1) is the CAP receptor, and a part of the transient release potential (TRP) ion channel family which helps the body in sensing heat or warmness. Conclusively, there are several studies which proved potential anti-inflammation role of CAP by the evidence that small-concentration of CAP treatment can attenuate systemic inflammatory cytokines during discrete stages of sepsis in rats. Moreover, the decreased levels of these pro-inflammatory cytokines are helpful to relieve NF-κB activation and osteoclastogenesis. CAP harboured in chili pepper has anti-inflammatory, antioxidant, antiproliferative and anti-cancer potentials. CAP has chemopreventive effect against a wide of chronic inflammatory diseases, including cancer. Additionally, some studies have shown the growth-inhibitory effect of CAP on several cancer cells, such as melanoma, mammary adenocarcinoma and hepatocellular carcinomaand adult T-cell leukemia (ATL) cells. It is worth mentioning that CAP also exerts pro-apoptotic effects on tumor neuronal cell lines., But cytoprotective or cytotoxic action of CAP was dependent on cell types and drug concentrations utilized by various researchers. 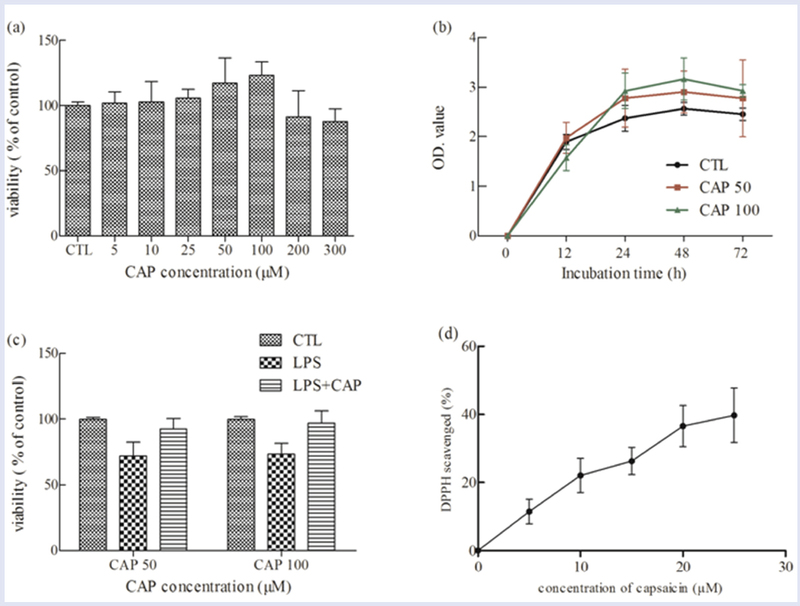 CAP has been also been reported to have anti-mutagenic and anticarcinogenic properties against human leukemic and hepatic carcinoma cells., Indeed, CAP potently inhibited lipid peroxidation and ROS generation in rat peritoneal macrophages and the inflammatory response in the sepsis model.,, Moreover, the induction of antioxidant enzymatic and non-enzymatic defense systems and suppression of MDA (Malondialdehyde) by CAP could be effective in preventing apoptosis activation by caspase cascades triggered by CCl4 which might be supported by previous findings.,, Anti-apoptotic effect of CAP is related to drastic reduction in intracellular ROS production. ROS have been thought to play significant role in causing apoptotic cell death. It is worth mentioning that CAP also exerts pro-apoptotic effects on tumor neuronal cell lines.The cytoprotective or cytotoxic action of CAP was dependent on the cell types and drug concentrations used. These results clearly indicate that the inhibition of intracellular ROS production might be caused by CAP-induced antiapoptotic effect in hippocampal neurons. CAP, a natural topical preparations are commonly used for muscle soreness and local application for painful traumatic injuries. CAP produces highly selective regional anesthesia by causing degeneration of CAP-sensitive nociceptive nerve endings which can produce significant and longlasting increases in nociceptive thresholds. It also inhibits NF-kB, thus producing an anti-inflammatory effect. There are topical CAP formulations now available to treat post-herpetic neuralgia. Other uses have been studied for peripheral neuropathies and chronic musculoskeletal pain. CAP can act as an antioxidant in the bio-membranes. CAP pretreatment also protects against the free radical-induced pulmonary damage in rats exposed to such gaseous chemical irritants as sulfur dioxide and nitrogen dioxide. Ultraviolet-induced lipid peroxidation in liposomal membrane was similarly attenuated by CAP. In conclusion, CAP is novel bioactive molecule but has not been explored fully. Other potential benefits of CAP should be explored with the aim of understanding of the molecular mechanism associated with its anti-cancer activities. This work has been supported by a grant from Next Generation Bio-green 21 (No. PJ01110102) and Rural Development Administration (RDA)-Free Trade Agreement (FTA) strategyissues (No. PJ01017003). The authors also extend their appreciation to the Deanship of ScientificResearch (RGP-VPP-089) at King Saud University for the help in research work. Hwang JT, Park IJ, Shin JI, Lee YK, Lee SK, Baik HW. Genistein, EGCG, and capsaicin inhibit adipocyte differentiation process via activating AMP-activated protein kinase. Biochem Biophys Res Commun 2005; 338: 694-9. Oyagbemi AA, Saba AB, Azeez OI. Capsaicin: a novel chemopreventive molecule and its underlying molecular mechanisms of action. Indian J Cancer 2010; 47: 53-8. Kobayashi M, Watanabe K, Yokoyama S, Matsumoto C, Hirata M, Tominari T. Capsaicin, a TRPV1 ligand, suppresses bone resorption by inhibiting the prostaglandin e production of osteoblasts, and attenuates the inflammatory bone loss induced by lipopolysaccharide. ISRN Pharmacol\2012; 2012: 439-860. Young-Joon Surh, Eunyong Lee, Lee JM. Chemoprotective properties of some pungent ingredients present in red pepper and ginger. Mutat Res 1998; 402: 259-67. Hassan MH, Edfawy M, Mansour A, Hamed AA. Antioxidant and antiapoptotic effects of capsaicin against carbon tetrachloride-induced hepatotoxicity in rats. Toxicology and industrial health 2012; 28: 428-38. Guo S-Y, Yang G-P, Jiang D-J, Wang F, Song T, Tan X-H. Protection of capsaicin against hypoxia-reoxygenation-induced apoptosis of rat hippocampal neurons. Canadian J Physiol Pharmacol 2008; 86: 785-92. Harada N, Okajima K, Arai M, Kurihara H, Nakagata N. Administration of capsaicin and isoflavone promotes hair growth by increasing insulin-like growth factor-I production in mice and in humans with alopecia. Growth hormone & IGF research : official journal of the Growth Hormone Research Society and the International IGF Research Society 2007; 17:408-15. Harada N, Okajima K. Effect of topical application of capsaicin and its related compounds on dermal insulin-like growth factor-I levels in mice and on facial skin elasticity in humans. Growth hormone & IGF research : official journal of the Growth Hormone Research Society and the International IGF Research Society 2007; 17: 171-6. Lee TH, Lee JG, Yon JM, Oh KW, Baek IJ, Nahm SS. Capsaicin prevents kainic acid-induced epileptogenesis in mice. NeurochemInt 2011; 58: 634-40. Kang JY, Teng CH, Chen FC. Effect of capsaicin and cimetidine on the healing of acetic acid induced gastric ulceration in the rat. Gut 1996; 38: 832-6. Amna T, Hassan MS, Shin W-S, Van Ba H, Lee H-K, Khil M-S. TiO 2 nanorods via one-step electrospinning technique: A novel nanomatrix for mouse myoblasts adhesion and propagation. Coll Surf B: Biointerfaces 2013; 101: 424-9. Jimenez-Andrade JM, Bloom AP, Mantyh WG, Koewler NJ, Freeman KT, Delong D. Capsaicin-sensitive sensory nerve fibers contribute to the generation and maintenance of skeletal fracture pain. Neuroscience 2009; 162: 1244-54. Sharma SK, Vij AS, Sharma M. Mechanisms and clinical uses of capsaicin. Eur J Pharmacol 2013; 720: 55-62. Ma L, Chow JY, Wong BC, Cho CH. Role of capsaicin sensory nerves and EGF in the healing of gastric ulcer in rats. Life Sci 2000; 66 :PL: 213-20. Amna T, Hassan MS, Sheikh FA, Lee HK, Seo KS, Yoon D. Zinc oxide-doped poly(urethane) spider web nanofibrous scaffold via one-step electrospinning: a novel matrix for tissue engineering. Appl Microbiol Biotechnol 2013; 97:1725-34. Russell ST, Tisdale MJ. Mechanism of attenuation by beta-hydroxy-beta-methylbutyrate of muscle protein degradation induced by lipopolysaccharide. MolCell Biochem 2009; 330:171-9. Amna T, Hassan MS, Shin WS, Van Ba H, Lee HK, Khil MS. TiO2 nanorods via one-step electrospinning technique: a novel nanomatrix for mouse myoblasts adhesion and propagation. CollSurf B, Biointerfaces 2013; 101:424-9. Brand-Williams W, Cuvelier ME, Berset C. Use of a free radical method to evaluate antioxidant activity. LWT1995; 28:25-30. Garcia EJ, Oldoni TLC, Alencar SMd, Reis A, Loguercio AD, Grande RHM. Antioxidant activity by DPPH assay of potential solutions to be applied on bleached teeth. Braz Dent J 2012; 23:22-7. Yang HW, Hwang KJ, Kwon HC, Kim HS, Choi KW, Oh KS. Detection of reactive oxygen species (ROS) and apoptosis in human fragmented embryos. Hum Reprod 1998; 13:998-1002. Shang K, Zhang J, Amna T, Yang J, Cheng X, Zhang C. Attenuation of cellular toxicity by calpain inhibitor induced by bacterial endotoxin: a mechanistic study using muscle precursor cells as a model system. Molecular Biol Rep 2015; 42:1281-8. Amna T, Van Ba H, Vaseem M, Hassan MS, Khil MS, Hahn YB. 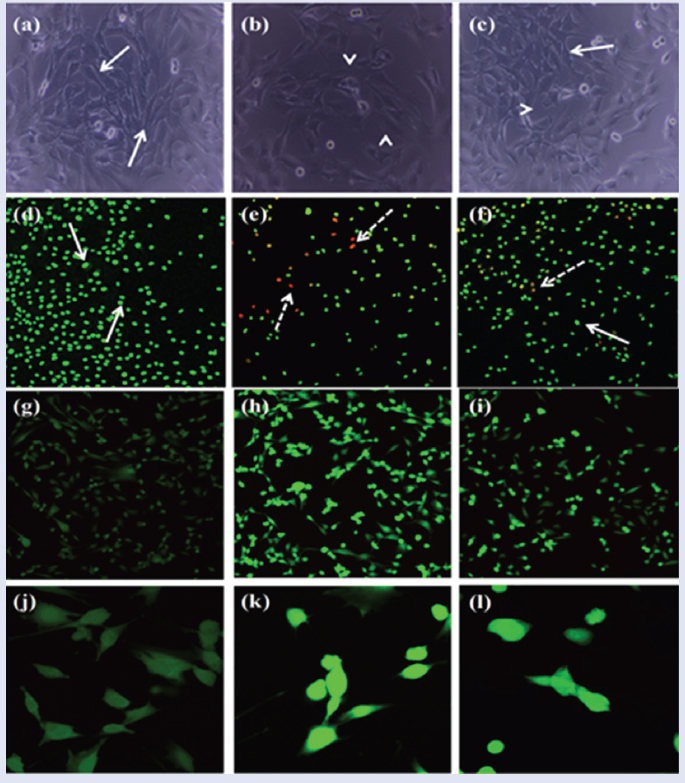 Apoptosis induced by copper oxide quantum dots in cultured C2C12 cells via caspase 3 and caspase 7: a study on cytotoxicity assessment. Appl Microbiol Biotechnol 2013; 97:5545-53. Michae lW Pfaffl. A new mathematical model for relative quantification in real-time RT–PCR. Nucleic Acids Res 2001; 29:2002-7. Helen L Eley, Steven T Russell, Tisdale MJ. Mechanism of attenuation of muscle protein degradation induced by tumornecrosis factor-α and angiotensin II by β-hydroxy-β-methylbutyrate. Am J Physiol Endocrinol Metab 2008; 295:E1417-E26. Huang J, Forsberg NE. Role of calpain in skeletal-muscle protein degradation. Proc Natl Acad Sci 1998 95: 12100-5. Galano A, Martinez A. Capsaicin a tasty free radical scavenger: mechanism of action and kinetics. The journal of physical chemistry B 2012 116: 1200-8. Zhou Y, Guan X, Zhu W, Liu Z, Wang X, Yu H. Capsaicin inhibits Porphyromonas gingivalis growth, biofilm formation, gingivomucosal inflammatory cytokine secretion, and in vitro osteoclastogenesis. EurJClin MicrobiolInfect Dis 2014 33: 211-9. Zhang J, Nagasaki M, Tanaka Y, Morikawa S. Capsaicin inhibits growth of adult T-cell leukemia cells. Leuk Res 2003; 27: 275-83. Amantini C, Mosca M, Nabissi M, Lucciarini R, Caprodossi S, Arcella A. Capsaicin-induced apoptosis of glioma cells is mediated by TRPV1 vanilloid receptor and requires p38 MAPK activation. J Neurochem 2007; 102: 977-90. Lee YS, Nam DH, Kim J-A. Induction of apoptosis by capsaicin in A172 human glioblastoma cells. Cancer Letters, 2000;161:121-130. Galati G, O'Brien PJ. Cytoprotective and anticancer properties of coenzyme Q versus capsaicin. 2003. Huang S-P, Chen J-C, Wu C-C, Chen C-T, Tang N-Y, Ho Y-T. Capsaicin-induced apoptosis in human hepatoma HepG2 cells. Anticancer Res 2009; 29:165-74. Joe B, Lokesh B. Role of capsaicin, curcumin and dietary n-3 fatty acids in lowering the generation of reactive oxygen species in rat peritoneal macrophages. Biochimica et Biophysica Acta (BBA)-Mol Cell Res 1994; 1224:255-63. 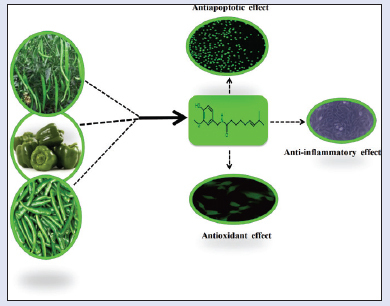 Kogure K, Goto S, Nishimura M, Yasumoto M, Abe K, Ohiwa C. Mechanism of potent antiperoxidative effect of capsaicin. Biochimica et Biophysica Acta (BBA)-General Subjects 2002; 1573:84-92. Okada Y, Okajima H. Antioxidant effect of capsaicin on lipid peroxidation in homogeneous solution, micelle dispersions and liposomal membranes.Redox Report 2001; 6:117-22. Riordan SM, Williams R. Mechanisms of hepatocyte injury, multiorgan failure, and prognostic criteria in acute liver failure Semin Liver Dis. 2003; 333 Seventh Avenue, New York, NY 10001, USA. Copyright© 2003 by Thieme Medical Publishers, Inc. 203-16. Guicciardi ME, Gores GJ. Apoptosis: a mechanism of acute and chronic liver injury. Gut 2005; 54: 1024-33. El-Mahdy MA, Zhu Q, Wang QE, Wani G, Patnaik S, Zhao Q. Naringenin protects HaCaT human keratinocytes against UVB-induced apoptosis and enhances the removal of cyclobutane pyrimidine dimers from the genome. Photochem Photobiol 2008; 84: 307-16.